Back in the early 2000s, after my husband and I had been retired for a while and traveled enough for me to get the wanderlust out of my system, I decided to write a mystery. It wasn’t my first attempt to write novel-length fiction. In the mid-80s, my brother and I collaborated on an action/adventure story based on his experiences in the truck-driving industry. It made it to audiotape … in 1999, almost 15 years after we finished it. My second attempt at novel-length fiction was a romantic thriller, also written in the mid-80s. It’s not very good, but there’s a kernel of plot that might work if I ever decide to do the necessary revisions. The one printed copy sits on the back of my desk, forlorn, waiting. Fast forward through many years of real world work, followed by travel, to 2003 when I settled happily into a less adventurous retirement and decided to craft that mystery. I took a novel writing class from Brian Kaufman at the Senior Center in Fort Collins, finished the book in 2004, and pitched it to an agent at a conference in Denver. Worst experience of my writing life, but that’s a story for another day. I went back to the conference in 2005 with that same manuscript, this time signed up for a critique workshop. The editor who moderated that workshop became my editor for the book and its sequel published by Five Star/Cengage. It took only four years for The Prairie Grass Murdersfrom completion to publication, some kind of amazing accident of fate that may never be repeated in my lifetime. But getting locked into a genre rut of writing only cozy mysteries was not for me. In between the two cozy mysteries, in the early 2000s, I wrote a historical novel, destined for five complete rewrites over the next few years. Then I tried a contemporary thriller, the first 50,000 words churned out during NaNoWriMo. The historical kept popping in and out of my work flow. Time passed. The novel didn’t fit anyone’s needs. The thriller, Dead Wrong, was picked up Five Star and released in 2014. I wrote another mystery that’s not quite finished. I’m almost done with the first draft of a suspense novel as well. Then Five Star launched Frontier Fiction, an all-genre historical line. I pulled out version three of the historical novel, tweaked it here and there, and submitted it to my editor. Finally, after all this time, that novel of my heart, has found a home. I suspect it will make it to the late 2017 release schedule, almost ten years after I completed the first draft. I think writers are more willing these days to genre hop. I certainly am. It stretches my imagination and challenges my plotting skills. So this is my best advice: Try something new from time to time and never, ever give up. Patricia Stoltey lives in Fort Collins with her husband Bill, Katie Cat, and new addition to the family, Sassy Dog. During her tumbleweed period, she traveled throughout the U.S. and Europe, including a solo jaunt to Norway to discover her roots. But that, also, is a story for another day. 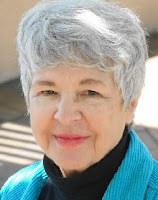 You can learn more about Pat and her books at her blog. She can also be found onFacebook, Twitter, and Goodreads. Thanks for stopping by, Margot. I think most of all I want to encourage beginning writers to keep trying but to recognize that it may take a long time to reach those important goals. 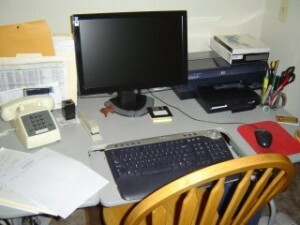 Hi Patricia, your workstation is so neat. We writers need loads of patience and perseverance to achieve our goals. Ten years in the making but it made it! I bet that story you wrote with your brother is interesting. I agree, the genre hopping can be a good thing. As you know, I've been all over the map with my writing. May not get excellent at any one, but I've learned so much along the way! It's also how we learn what we're really good at, Dean. Not all of us have the single-minded dedication of a gymnast or ballerina. Sometimes we have to try several options before we figure it all out. Inspiring as always, Pat. I lean toward different genres. Thriller and suspense are my favorites, but I also love writing comedy. Humor writers will always find an audience, Luana. Wouldn't it be fun to write a play and have it performed, especially if you can make an audience laugh? A great example of never giving up. Go, Pat! Hi Natasha! Isn't it funny how some stories just get stuck in your mind, or heart, and won't go away? I'm very excited that "Wishing Caswell Dead" finally has found a home so I can stop obsessing about it. I love how you never gave up on the story that meant so much to you, Pat. A great reminder that writing is a long-term pursuit! Yes, there were times, Colleen, when I wondered if I would live long enough to see this novel published. I was this far (inches) from self-publishing. Great story ! Persistence !! Way to go, Pat.